Home / News / CALLING ALL PUNKS for New Exhibition! CALLING ALL PUNKS for New Exhibition! We’re hosting an exhibition of Punk(ish) art this Winter in the West Gallery and are looking for punks past and present to get involved. 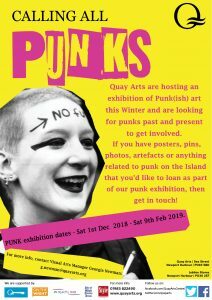 So if you have posters, pins, photos, artefacts or anything related to punk on the Island and it’s legacy that you’d like to loan as part of our punk exhibition, then get in touch!